E3 2013 was the biggest showdown in gaming history, as the two giants Microsoft and PlayStation renewed their rivalry, each showing their much anticipated new consoles in a face off. 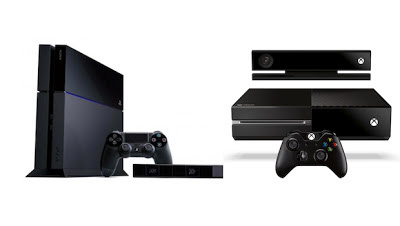 Though, looks doesn’t really matter in console IMHO, but the PS4 is better looking if we have to take out a winner. The Xbox One, of course, isn’t going to be miles behind, either. But Sony’s console will pack the fiercest punch. A fundamental category, in which neither side quite claims victory. At the Xbox press conference, Microsoft revealed new instalments of the Halo and Forza series, as well as new title Ryse: Son of Rome and the long-awaited return of Killer Instinct. PlayStation, meanwhile, have a raft of new franchises, including new racer Drive Club, Knack, and The Order: 1886. Complete list of PlayStation 4 games. Popular series Infamous and Killzone will also return. But big titles such as Call of Duty and FIFA will be available on either console – meaning software won’t be a deciding factor between the two. While the Xbox One got a lot of back lash with their ‘always on’ Kinect which prompted hyperbolic security fears across the globe. While Sony played down the role of the PlayStation Camera. In fact, it was only used to help showcase title The Playroom. As Xbox staffers faffed about with needless voice control demonstrations, The Playroom demonstrated how a console camera could be innovative and essential. Crucially, it goes a long way to justifying the camera’s constant presence in your living room. None of the Xbox One’s leading titles make any significant use of the Kinect – making it easier for scaremongers to convince users that the camera is a cynical data gathering tool from Microsoft. It’s not – but they still need to make better use of it. The biggest talking point of E3 – the revelation that PlayStation had managed to under-cut their rivals by about £80.Notoriously expensive, and with a piece of kit universally considered better, news that the PS4 would come in £80 less than the Xbox One was a real surprise. It was widely known that Sony would announce a £349 price-point, which made Microsoft’s decision to go to £429 all the more staggering. The PS4 controllers will also be a fiver less than those for the Xbox One (£59.99), while games on both platforms are currently being advertised at £54.99. But that short-fall could be made up by the fact that the Xbox One will come bundled with the Kinect – while the PS4 camera, listed at £44.99, will have to be bought separately. And Sony will also introduce an Xbox Live style subscription fee for online gaming, as part of PlayStation Plus. Lost amongst their catastrophic mis-management of console announcements and poor PR, Microsoft do have a reason for cheer. They have delivered on their promise of making a multimedia box. The 360 has already established that nice – widely replacing the family DVD player. Whether it can go a step further than that, remains to be seen – but the Xbox One, as with its predecessor, is certainly forcing Sony to play catch-up. As it stands, the PlayStation 4 is streaking ahead of its rival platform. Sony really played their hand to perfection, and will be feeling pretty pleased with themselves after E3. But we're still at least five months away from launch. You can be sure that Microsoft will be turning on the charm offensive over that time. That said, after a rocky beginning to the PS3 generation, PlayStation will be eager not to rest on their laurels. Which, hopefully, means it's all to gain for the gamer.